Pressurized nitrogen gas is most typically used supply the static fluid loss testers with main cell pressure and backpressure for the filtrate receiver. 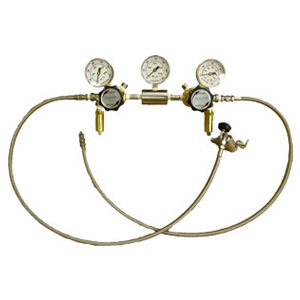 The nitrogen manifold is a dual pressure supply manifold capable of supplying 750 psi maximum to the filtrate receiver and 2,500 psi to the main cell. Precise pressure regulators allow for fine control. Safety pop-off valves are utilized to prevent over-pressure situations.